Host Sara Gallegos works with guests to explore quilting ideas, both old and new, in this series from Iowa Public Television. 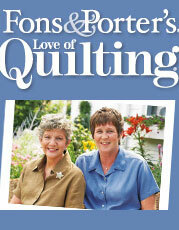 Whether a beginner or an expert, quilters of all levels will learn something from the tips, techniques and designs featured on this show. Segments from the series include two quilts that feature a diagonally set log cabin design, a small quilt constructed with English paper piecing, a breakdown of a medallion-style quilt into simple lessons and how to re-size a quilt block into larger and smaller versions.